Technical and RF Hardware Information for the GB3BS Repeater. The GB3BS UHF Repeater comprises of several units that all come together in one rack. 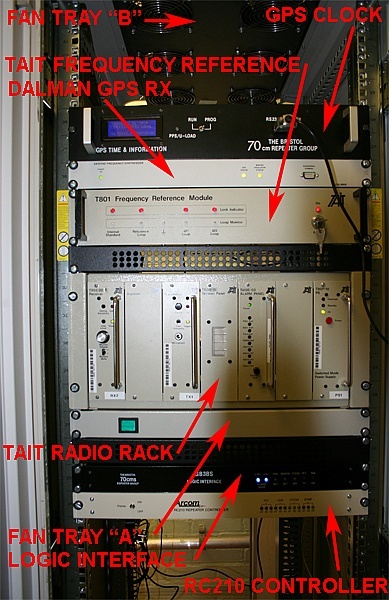 The repeater is based on the Tait T800 Mk1. It is a highly popular unit often found within the commercial PMR world.The main units (left to right) are the Receiver, Transmitter, Monitor Speaker, Alarm Monitor and the Power Supply Unit. The rack and all the modules within it remain unmodified as this helps for quick replacing of modules should a fault develop. Within the rack (between the Tx & Rx modules) is also mounted the six cavity Diplexer. Although with the addition of GB7BS this is no longer the primary Diplexer. Below the Tait T800 is the Mk1 Logic interface unit, which was designed and built by the repeater group. Transmitter and Receiver Performance Data. Transmitter Output Power: 15 Watts, 11.8dbW (into Diplexer Tx port). Feeder Type: CELLFLEX LCF78-50JA-A1. Feeder Losses: 0.8db. Antenna Type: Commercial grade SA-400 series, Gain: 5.5dbd. Receiver Sensitivity: -120.5db for 12db Sinad. (at Rx port). Diplexer Losses: Tx port: 0.8db Rx port: 0.6db. CW ID Deviation: 1.5 KHz. Peak Through Audio Deviation: 4.7 KHz. 1750Hz Tone notch filter attenuation: >60dbr. Antenna combining network for GB3BS & GB7BS.